There’s something about the Antiquities’ Wellington Inn that keeps guests coming back. Maybe it’s the stately mahogany and leaded glass foyer, which give an immediate impression of the elegance of a bygone era. Perhaps it's the long front porch that seems made for lazy afternoons and lively conversation. Or maybe it’s simply the gracious hospitality of Owner, Barb Rishel. “People are looking for something unique when they come here,” explains Barb. They definitely find it here. 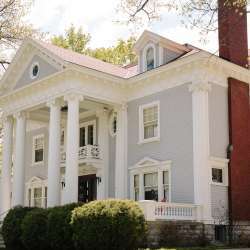 Built in 1905 by one of the area’s lumber barons, Wellington Inn retains much of its original neo-classical character, thanks to a top-to-bottom (but true-to-its-design) restoration completed in 2012. A beautiful muslin fabric with stencils ascends the main staircase; a nod to the Scottish heritage of the original owners, the Hull family. 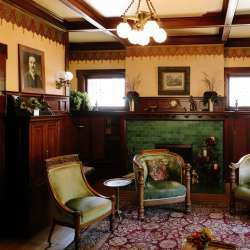 The Hulls were owners of the Oval Wood Dish Company, Traverse City’s largest employer at the turn of the 20th century. All of the home’s light fixtures are original and the five in the dining room were made by Morgan & Sons of New York City. 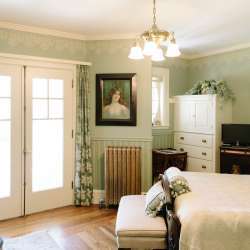 The main house of the Inn has four rooms done in classic Victorian style, with period furniture and accents. The Inn also has a carriage house that once served as stables for the Hull family’s ponies. It recently underwent a full restoration and now features two apartments; one done in Art Deco and the other in French Country décor.